Believe it or not, there are different and easy methods that you can use to shred a cabbage. Although it might seem as a relatively useless skill to have at first, you won’t know how effective it is until you really need it. In fact, if you’re here right now, you’re probably regretting not having learnt it sooner! 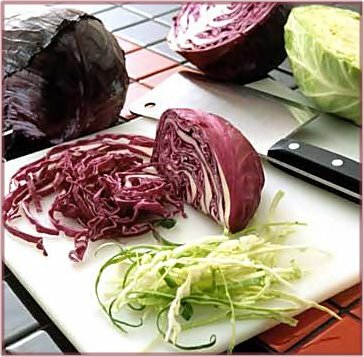 If you need to prepare a salad or soup quickly, we’ll rapidly guide you through each step you’ll need to go through if you want to end up with a well-shredded cabbage. It doesn’t take too long to shred but be sure to follow each step carefully. Keep in mind you’ll get a different texture depending on which method you use to cut it – shredders tend to produce thin pieces of food, so manual cutting might be your go-to choice if you want bigger chunks! 3.6 Place everything in a bowl… And you’re done! Graters will produce very good results, and everything will be ready to eat once you’re done grating the cabbage… But the outer layer of the vegetable must be removed if you seek optimal results. Cabbages tend to have a lot of bruising on the outside, and in most cases, there are clear signs of damage going through the vegetable’s exterior. You’ll need to get rid of everything that looks iffy. Remove every part of the vegetable that has a weird coloration or any marks of damage before grating it. 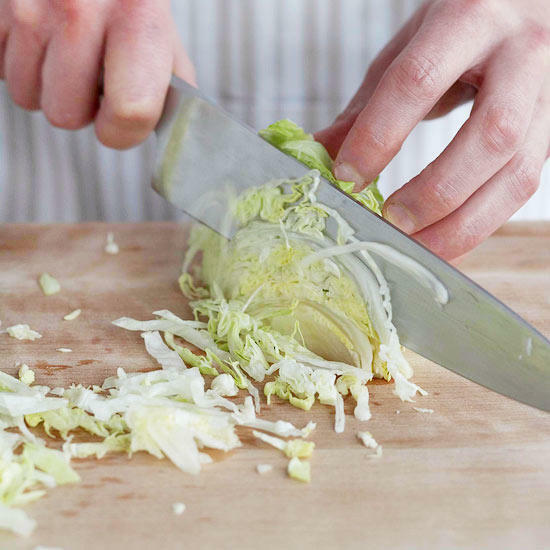 Use a normal-sized knife to cut the cabbage in half. Then, cut both halves again. This will help you simplify the grating process and maximize the effectiveness of your kitchen appliance. Working with bigger chunks is never a good option – especially with manual graters. It can be very difficult to shred anything that’s too big! If you’re going to grate a large cabbage, you’re going to need a large bowl to fit all the little pieces inside. Of course, you should also account for the size of your grater when you choose a bowl. Make sure it’s big enough to fit both the grater and the pieces of cabbage. Try to avoid contact between tables and the shredded cabbage, as cleaning it afterwards can be quite troublesome. Be sure to thoroughly wash the grater before you start as well. Select the side of the grater with the best size for your needs and pick up one of the four pieces of cabbage that you have. Move it relentlessly up and down the grated until it’s fully shredded. The small pieces of cabbage will fall on the inside of the grater. Disperse the contents inside the grater after finishing with each piece, to make sure the other pieces have enough room to get shredded into. 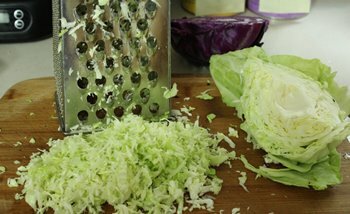 This process usually ends with the grater being full of different pieces of cabbage all over it. Remove them by hand and clean the grater. Your cabbage should be shredded and ready to be used in any meal! Make sure you remove the outer layers of the cabbage first, and then cut the cabbage into four equally-sized pieces before moving on to the blender. Do not attempt to place more than one piece inside the blender at the same time. Make sure to tightly fit each one into the blender as well. Turn on the blender for a few seconds and then let go of the button. Do this process a few times with each piece until they’re fully shredded. You’ll have to judge when it’s done – stop the process as soon as you feel you’ve reached the right shredding size. That’s it. Shredding with a blender is the most straightforward way to do it… But you’ll end up with very tiny pieces! Keep that in mind if you’re looking to make a salad, you might want to manually cut the cabbage with a knife. Be sure to get rid of any damaged parts of the cabbage, so only clean pieces remain on sight. If you’d like, you could also cut off the steam to make the cabbage flat on the bottom. This makes the process easier by making the cabbage stay in once place while cutting it by resting it on the cut-out steam. To do this, you’ll have to place the cabbage sitting on the cut-off steam first. Then, simply perform a clean cut going through the middle of the cabbage. Once you cut it in half, cut each piece once more. Remember that the steam shouldn’t be eaten – let alone included in salads. Remove it from each slice and then gently cut each one into strips. Just place each circular strip in your table and cut it vertically various times. It’ll create larger strips which you can then cut easier. You can stop once you see fit. You can judge the size of the cabbage strips depending on what you require them for. Place everything in a bowl… And you’re done! Collect all the shredded pieces of cabbage and put them in a bowl. You can decide what to do with them whenever you want. The most important thing you need to know before getting started is that the size of each shredded piece of cabbage is entirely related to the method you use. 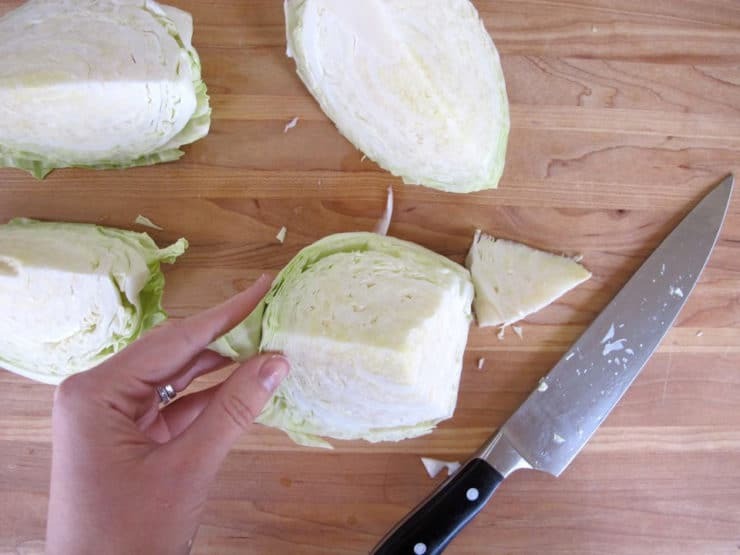 If you manually cut the cabbage using a knife, you’ll find that it’s easy to get everything to the size you want it to. 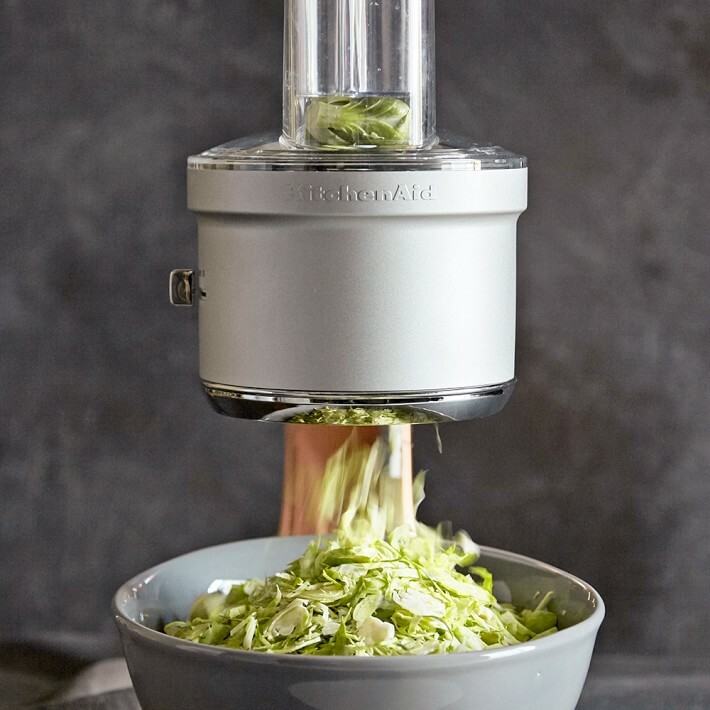 On the other hand, a shredder lets you select which of its sides to use, and a blender will most likely turn your cabbage into a bunch of very small pieces. Make sure you know what you want before getting started so you can work towards an end product that suits your needs! Shredding cabbages is easy – regardless of which method you choose. Make sure you do everything slow and steady, noticing the size of the cut cabbage pieces as you go on. Stop shredding as soon as you’re comfortable with the size of your pieces, and you’ll be good to go. If you decide to do things manually, be careful when handling the knife!